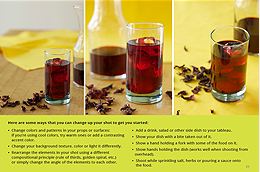 This mini-guide is perfect for helping you take mouth-watering photos of food. It’s a quick read, but don’t let its size fool you. 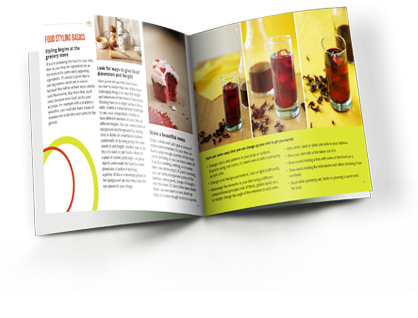 Bursting with tips, tricks and techniques this eBook will ensure the snaps you take of the food you cook or eat are as tasty as the meal itself! Food makes a fascinating subject because it appeals to all of our senses and so many emotions. As photographs, the dishes we create and consume become a canvas for stories of tradition, creativity, joy, pride, comfort, nature, flavor. We reach for our cameras to capture a delicious moment, to preserve a work of perishable art. 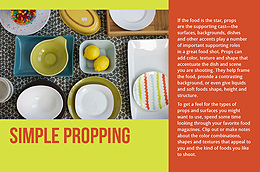 This mini-guide will show you how, with just a little bit of planning and preparation, you can recreate professional-looking, mouth-watering food photography in your own home. If you’ve ever looked at other people's pictures of food and thought to yourself, “Why don’t mine look like that?” then this is the guide for you. It breaks down all the important aspects of photographing food. Then, once you understand the ingredients to great food photography you’ll be guided through developing a food photography style of your own. The guide doesn’t overcomplicate things with technical jargon – everything is explained in a way that everyone can follow and understand. Ready to improve the quality of your food photography? Paul O'Hanlon has been shooting food and other commercial subjects for 20 years. He's assisted on shoots for Wine Spectator and Wynn Las Vegas, working with celebrity chefs like Daniel Boulud and Charlie Palmer. His work appears regularly in Edible Hudson Valley, and he counts local award-winning craft breweries and other publications among his clients — including a new iPad magazine called Honest Cooking. He teaches classes on digital photography in the Hudson Valley and online, and you can find out more at BeaconLightworks.com or on Facebook. Food and food photography have long been two of Kelly Kingman's many passions. As a photo editor for various magazines and newspapers she produced studio shoots as well as location shoots at world-class restaurants such as the Waldorf-Astoria hotel and WD-50 in New York City. As a writer, Kelly has covered culinary topics for national publications such as Gourmet and as a restaurant critic for a newspaper in New York’s Hudson Valley. Her favorite assignment was spending three days among the students of the Culinary Institute of America for American Way magazine. She also currently consults and writes about content marketing and creativity. Connect with her at kellykingmanmedia.com or via Twitter (@kellykingman). We all eat – so pretty much everyone who likes taking and sharing photos! If you love taking pictures of food this is a perfect companion. If you’re not satisfied that SnapnFood is helping your photography within 60 days, just let us know and we will refund your money. That’s how confident we are that this resource will help you improve your photos of food. What gear will I need for this eBook? – You won’t need a heap of fancy equipment to follow this book. 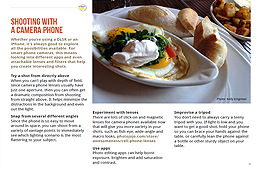 There’s even a section on taking food photos with your phone! Most of the photos in this mini-guide were shot in our house just a good camera and a tripod, and not in a photo studio. Start taking better photos of food today. 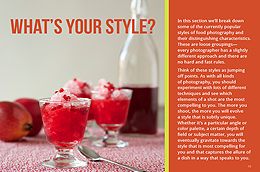 Start defining your own food photography style. 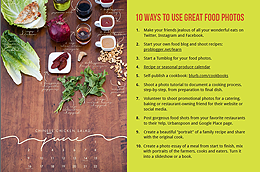 Capture and share the mouth-watering memories of all the great meals you create or eat. 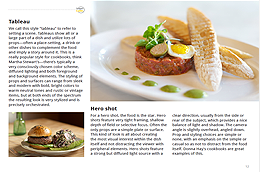 … Pick up a copy of SnapnFood today.